Wow! There’s a lot going on with propellers that I didn’t know about. 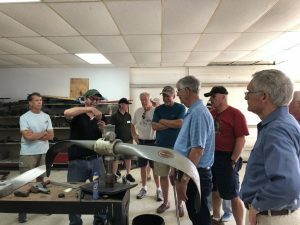 Karl Byam, President of Byam Propeller Service, Inc gave our chapter the ultimate tour of his facilities. This One May be Out of Spec! 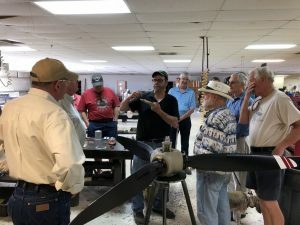 Karl is the second generation President of this FAA Repair Station that specializes in overhauls, servicing, trouble shooting, and dynamic propeller balancing at Ft Worth Meacham (KFTW). 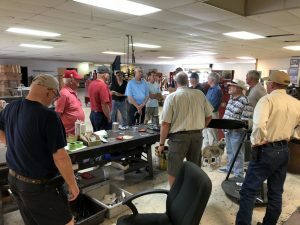 We had a great turnout, followed by lunch just across the street at Heavens Gate. The name seemed appropriate, since the food was both delicious and loaded with all the stuff that will send you to an early grave if you eat there too often. Back to propellers. Not sure I have all this down correctly, but there are both advantages and drawbacks to every design. And a few nuggets of wisdom from Karl. For example, MT Props are plagued with very slow overhaul turnarounds, since there are very few shops that have the expensive, specialized tools required. Hartzell props should be balanced using the ring on the front. For some reason, some mechanics don’t want to put the balance weights there, but it’s really the best choice. Hamilton Standards are painful to rebuild and typically require many, many iterations to get all the shims just right. Some time ago, McCauley chose to retire it’s threaded hubs in favor of a no-threads blade retention system. The new design has some fore-aft play that is normal. But if you find this on an older threaded McCauley or any Hartzell, don’t take off! Looks like Don learned something he didn’t want to know!